It’s not Christmas without Christmas carols. Many of our most traditional carols are filled with lyrics and lines that leave the modern caroler bewildered. One of my favorite holiday tunes is “Here We Come A-Wassailing,” also commonly known as “Here We Come A-Caroling.” Just what is wassailing? Is it just an archaic word for Christmas caroling? Actually no, it isn’t. While the two terms have become generally accepted as interchangeable, caroling is just one aspect of a much deeper and more profound tradition of wassailing. In ancient Europe, wassailing was an important element in the highly tree oriented Anglo-Saxon religious complex. 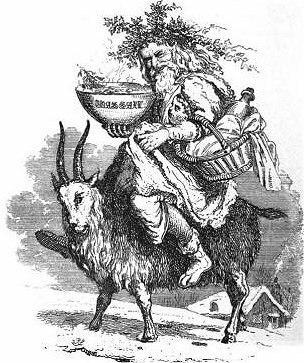 The Yuletide rite consisted of a parade of revelers singing hymns and playing their drums and other musical instruments, roving between the orchards, leaving offerings and pouring libations. The ceremony was intended to awaken the apple trees and chase away malevolent spirits in order that the trees should be healthy and produce an abundant crop the following year. 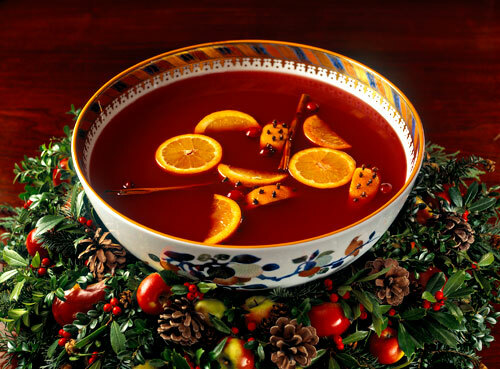 Hot mulled cider, prepared from the recent harvest was the traditional and symbolic drink consumed and offered at these ceremonies. During the medieval period, under feudalism the wassail developed into a midwinter ritual in which the wealthy Lord would distribute goods from his storehouses to the peasants who worked his lands. In exchange for gifts of his best foods, beers, ales, and wines, the Lord could be assured his people’s allegiance and fealty for the next year. During the late sixteenth century, bands of young men would travel from orchard to orchard on Twelfth Night, performing the wassailing rite. 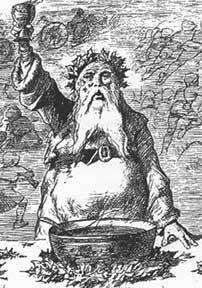 They would take their wassail bowl with them and leave offerings of bread or toast on the roots or branches of trees. Libations of cider were poured on the roots in order that the trees would produce an abundant harvest the following year. Wassailing cups and bowls were important communal ceremonial items used within all levels or society. Wassail vessels came in many varieties from the large and intricately decorated silver goblet used by the Worshipful Company of Grocers guild, to the simple white maple bowls used by commoners. During the later historical era wassailing became associated with roving bands of the poor who would descend upon their wealthy neighbors’ homes at Christmastime. Singing and dancing, they wassailers would demand entrance into the house, and shares of the residents’ best liquors and deserts. This rite is forever enshrined in the words to the popular carol We Wish You a Merry Christmas; “Now give us some figgy pudding,” and “we won’t go until we get some!” The estate’s owner was fully expected to play along and contribute to the “good cheer.” If he didn’t, he could expect his reputation to plummet and possibly his property vandalized. The old Yuletide holiday was celebrated in a fashion more similar to Halloween and trick-or-treat than to our modern Christmas. This drunken disorderliness is one of the reasons used to outlaw Christmas celebrations by the newly empowered puritans in the Commonwealth of England during the mid seventeenth century. Over the past few centuries, the roving gangs of wassailers have become tamed into the serene image of the Christmas caroler singing from door to door in the white winter weather, sipping on hot apple-cider. The hooligan shaking down the neighborhood for treats has been reserved for Halloween. Our modern tradition of wassailing has taken an intriguing path on its way to us. Now we can make a little more sense out of the opening lines of that old favorite at Christmastime. “Here we come a-wassailing among the leaves so green,” is reminiscent of the old ritual of visiting the orchards, singing to the health of the apple trees to ensure the following year’s harvest. * The date of Twelfth Night is in dispute in certain parts of Britain. The date on the Gregorian calendar corresponds to January 6th, or the eve of January 5th. The pre-Gregorian, Julian date which is followed by the old traditionalists falls on January 17th.